Modular systems can be extended by adding additional software packages to the framework. Administrators need an easy way to see which features are installed in which version and for sure to add, update and remove packages. OTRS uses a package manager to perform all package-related activities as mentioned above in the graphical interface. This module is only available when using On-Premise or the ((OTRS)) Community Edition. To see a list of installed modules, you may also see the Support Data Collector. 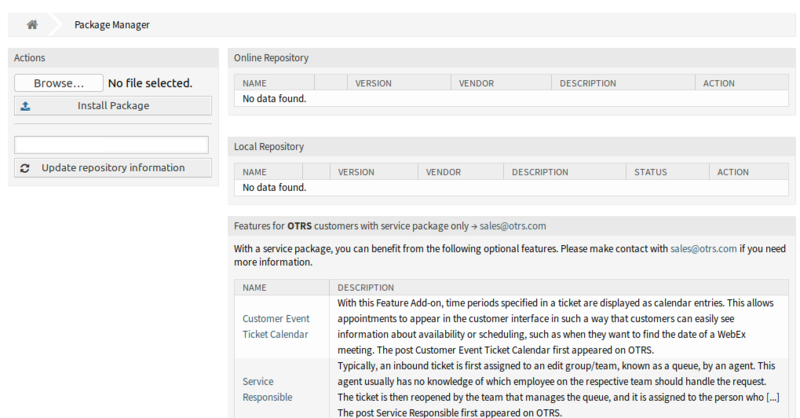 Use this screen to install and manage packages that extend the functionality of OTRS. The package manager screen is available in the Package Manager module of the Administration group. The installation of packages which are not verified by the OTRS Group is not possible by default. You can activate the installation of not verified packages in the system configuration setting Package::AllowNotVerifiedPackages. Select an online repository from the drop-down in the left sidebar. Click on the Update repository information button to refresh the available package list. Select a package from the Online Repository widget and click on the Install in the last column. After installation, the package is displayed in the Local Repository widget. The repository list can be changed in system configuration setting Package::RepositoryList. Click on the Browse… button in the left sidebar. Select an .opm file from your local file system. Click on the Install Package button. Check the available packages in the Online Repository widget if there is Update in the Action column. Click on the Update link. After updating, the package is displayed in the Local Repository widget. Select an .opm file which is newer than the installed package. Click on the Update all installed packages button in the left sidebar. This feature reads the information of all defined package repositories and determines if there is a new version for every installed package in the system and calculates the correct order to update the packages respecting all other package dependencies, even if new versions of existing packages require new packages not yet installed in the system. If there are packages installed that do not have a corresponding repository defined in the system, they can not be updated by this feature and will be marked as failed (due to the missing on-line repository). If at least one of the package files are modified locally, the package manager marks the package as broken, and need to reinstall. Select the package from the Local Repository widget that are marked for reinstall. Click on the Reinstall link in the Action column. Select the package from the Local Repository widget. Click on the Uninstall link in the Action column.